Multiple myeloma (MM) is a plasma cell neoplasm characterized by abnormal proliferation of plasma cells and constitutes 10% of all hematological malignancies. The annual incidence in the USA is 4.3 per 100,000, with over 20,000 new patients recorded every year. MM usually manifests in the later stages of life, that is, during the fifth or sixth decades in the majority of cases and among 2% of patients <40 years of age. The most common presenting clinical features are fatigue, bone pain, anemia, osteolytic lesions, hypercalcemia, and impaired renal function. The exact etiology of MM remains obscure; however, certain chemicals such as dioxins and solvents and viral infections including human herpes virus 8, hepatitis B virus, human immunodeficiency virus, and Epstein–Barr virus have been associated with the development of MM. Based on the paraproteins secreted, plasma cell myeloma is categorized into complete immunoglobulin (Ig) or light-chain myeloma. Analysis of 10,000 patients with MM has revealed that the most frequently secreted paraprotein is IgG (60%) followed by IgA (24%), IgD (2%), IgM (0.5%), rarely IgE, and 11% light-chain kappa (κ)- or lambda (λ)-only myeloma. The presence of these paraproteins or monoclonal (M) proteins in serum or urine is a characteristic diagnostic feature of MM in a vast majority of cases. 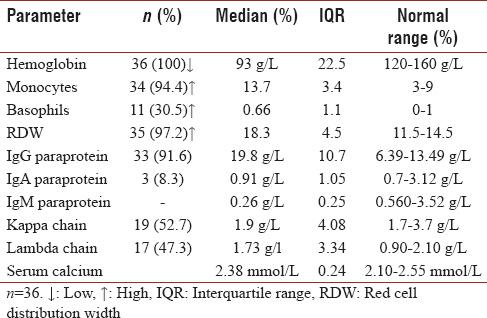 Conventionally, M proteins are measured by 24-h urine collection test and serum protein electrophoresis in blood samples followed by paraprotein identification by immunofixation. It has been observed that MM exhibits gender and racial disparity. MM appears to affect males more frequently compared to females. The prevalence of MM is twice as common among individuals of African origin compared to Caucasians, which has been attributed to higher prevalence of monoclonal gammopathy of undetermined significance among Africans., This retrospective study was performed to assess the patient characteristics and clinical features of MM Saudi population who attended King Khalid University Hospital during the study period. This retrospective study was performed at King Khalid University Hospital, Riyadh, Saudi Arabia. The study was approved by the local Ethics Committee. Data were extracted from the available MM patient records between November 2014 and September 2017. During the study period, MM was diagnosed among 36 patients (mean age: 65.2 ± 11.2 years) comprising of 5 (13.8%) patients with <50 years of age. This group of patients included 19 females and 17 males of Saudi nationality with multiethnic backgrounds. Demographic details and information about the presence of M band, paraproteins, hematological abnormalities, and concomitant disorders were collected from the patient records. Each patient was diagnosed using CRAB criteria along with the presence of one of the three myeloma-defining events (MDEs). Data for bone marrow biopsy findings and detection of M band by serum electrophoresis and urine electrophoresis were also extracted from the patient records. Additionally, kappa (κ) and lambda (λ) light chains were identified using flowcytometric analysis and nephelometry. None of the patients were found to have smouldering myeloma. Serum and urine electrophoresis was performed by using Capillaries Protein (E0 6 kit in Capillaries instrument, Capillarrys System Ilex Medical Ltd, South Africa). The capillaries protein (E) 6 assay is based on capillary electrophoresis in free solution. Serum or urine proteins were separated in silica capillaries by their electrophoretic mobility and electroosmotic flow at high voltage in an alkaline buffer. Proteins were detected during migration by ultraviolet absorbance. 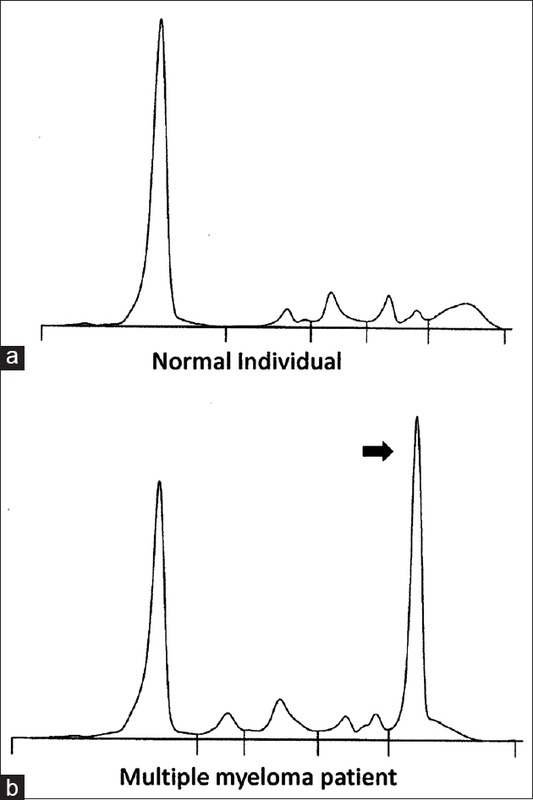 [Figure 1] shows serum protein electrophoresis from a normal individual and a patient with MM demonstrating an M band peak in the gamma region. Assessment of Igs was performed by nephelometry and was expressed as the concentration of each protein. Data were analyzed by MedCalc statistical software (version 14.8.1, MedCalc Software bvba, Ostend, Belgium). Numeric data were summarized as median with interquartile range and categorical data were summarized as numbers and percentages. 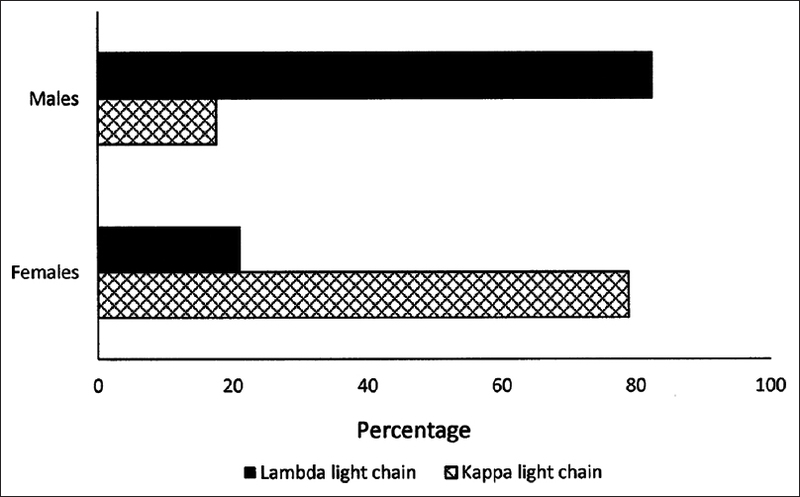 [Figure 2] shows the distribution of κ and λ light chains among the male and female patients with MM. Out of the 19 female patients, 15 (78.9%) had κ chain restriction, whereas among the 17 male MM patients, 14 (82.3%) had λ light-chain-restricted disease. [Table 1] shows the data of variables among patients with MM that did not conform with the values of acceptable range. All the patients had lower hemoglobin (median 93 g/L; IQR 22.5) than the expected normal range (120–160 g/L). Among the leukocytes, the median monocyte percentage (13.7%; IQR 3.4) was higher than the normal range (3%–9%) among the majority of the patients with MM. Red cell distribution width (RDW) of 35/36 (97.2%) MM patients was consistently higher (median 18.3%; IQR 4.5) than the expected normal range (11.5%–14.5%). IgG paraprotein was detected among 33 (91.7%) patients, whereas IgA paraprotein was present among 3 (8.3%) patients with MM. IgM or IgD paraprotein was not detected in any patient. [Figure 3] shows data for concomitant disorders among the patients with MM. Diabetes mellitus was the most frequently occurring disorder among MM patients, with 34/36 (94.4%) patients suffering from the disorder. 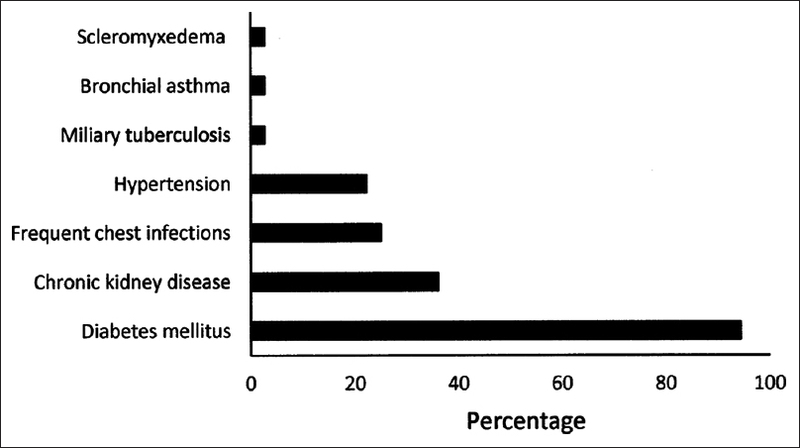 There were 13 (36.1%) patients with chronic kidney disease followed by 9 (25%) patients with frequent chest infections and 8 (22.2%) with hypertension. A strong gender preference was observed for κ light chain among females and λ light chain among the male patients with MM in the present study. Despite exhaustive literature search, we could not find any previous report describing similar gender preference among MM patients. Patients with κ Bence Jones proteinuria respond better to treatment than those with λ Bence Jones proteinuria, resulting in better survival of κ-excreting patients. Similarly, patients with free κ light chain disease tend to survive longer compared to those with λ light chain disease. Gender preferences for the light chains observed in the present study may influence survival rates between the genders. This study was limited by small numbers, and observation of gender preferences for κ and λ light chains among MM patients should be validated in a large cohort of patients as the group in the present study represented a multiethnic population. All the MM patients (100%) in the present study were suffering from anemia. The prevalence of anemia in the present study appeared to be considerably higher than that (49%) reported in a recent large-scale Swedish study of over 4000 MM patients. Fatigue is among the most common presenting symptoms of MM and has been linked with anemia. Successful treatment of anemia in MM not only alleviates fatigue, but has also been shown to be associated with a remarkable improvement in health-related quality of life scores. In addition to MM, the relationship of fatigue and health-related quality of life improvement appears to exist in other malignant disorders. Cancer patients with solid tumors and lymphoproliferative malignancies on and off chemotherapy have been shown to exhibit considerable improvement in fatigue along with physical, functional, emotional, and overall well-being. These observations emphasize the need for restoration of hemoglobin to optimal levels not only in MM but also in other cancers for achieving improvement in quality of life. Among the red blood cell indexes, the percentage of RDW was higher among MM patients in the present study. RDW has been traditionally used for differential diagnosis of various causes of iron deficiency anemia and has recently been reported as an inflammatory marker in conditions such as renal disorders, lung cancer, and critically ill patients for predicting morbidity and mortality. Although a neoplasm, MM has been reported to harbor inflammatory microenvironment, and elevated RDW at diagnosis is considered a poor prognostic marker for progression-free survival in MM. Little is known about increased RDW association with MM. However, a recent meta-analysis and systematic review has demonstrated that RDW may be a useful prognostic marker for cancer patients and high RDW is associated with poor outcomes. Percentage of monocytes in the peripheral blood of 34 (94.4%) MM patients was higher than the normal acceptable range. Increased percentage of monocytes in the peripheral blood has been reported to be due to increase in CD14+CD16+ monocyte subset in cancers. This subset of monocytes has recently been reported to increase in MM, and the proportion of CD14+CD16+ cell increase positively correlates with tumor load. Moreover, these CD14+CD16+ monocytes are considered to be potential marker of osteoclast progenitors that are involved in bone resorption and formation of lytic bone lesions. The increased CD14+CD16+ monocytes in the peripheral blood could be due to increased CD14+CD16+ cells in the bone marrow of MM patients. The bone marrow CD14+CD16+ cells harbor upregulated genes involved in osteoclast formation and have been shown to be more pro-osteoclastogenic than CD14+CD16− cells ex vivo. Moreover, expansion of monocyte population with increased monocyte-lymphocyte ratio has been shown to be a predictor of unfavorable clinicobiological features and poor disease outcome. Type 2 diabetes mellitus (T2DM) was the most frequent concomitant disorder and was present in 34 out of 36 patients in the present study. Conditions such as chronic kidney disease, hypertension, and repeated chest infections among the MM patients could be related to the primary disorder, whereas association of MM with T2DM appears to be real. Diabetes has been linked with increased risk of cancers such as liver, colon, pancreas, and breast. T2DM is frequently found in MM patients, and the prevalence of T2DM among MM patients has been reported to be between 11% and 22%. This being a single-center study, 94.4% prevalence of T2DM in a relatively small number of MM patients appears to be substantially higher. Moreover, diabetes has been shown to have a negative impact on the prognosis of MM most likely through hyperglycemia-triggering myelomagenesis through insulin-dependent and insulin-independent mechanisms. Gender preferences observed for κ and λ light chains in this study require validation in large-scale studies. Light-chain detection in the absence of immunofixation was a limitation of the study. Association of increased RDW with MM also requires further validation. This was a single-center study comprising of a relatively small number of MM patients, and hence the findings may not be applicable to the local population of MM patients. Kyle RA, Therneau TM, Rajkumar SV, Larson DR, Plevak MF, Melton LJ 3rd, et al. Incidence of multiple myeloma in Olmsted county, Minnesota: Trend over 6 decades. Cancer 2004;101:2667-74. Kyle RA, Gertz MA, Witzig TE, Lust JA, Lacy MQ, Dispenzieri A, et al. Review of 1027 patients with newly diagnosed multiple myeloma. Mayo Clin Proc 2003;78:21-33. 't Mannetje A, McLean D, Cheng S, Boffetta P, Colin D, Pearce N, et al. Mortality in New Zealand workers exposed to phenoxy herbicides and dioxins. Occup Environ Med 2005;62:34-40. Keyvani H, Karbalaie Niya MH, Esghaei M, Bokharaei-Salim F, Monavari SHR. Presence of human herpesvirus 8 (HHV-8) DNA sequences in patients with lymphoproliferative diseases and chronic blood disorders. Microb Pathog 2017;111:431-4. Varma A, Biritxinaga L, Saliba RM, Stich M, Jauch SF, Afrough A, et al. Impact of hepatitis B core antibody seropositivity on the outcome of autologous hematopoietic stem cell transplantation for multiple myeloma. Biol Blood Marrow Transplant 2017;23:581-7. Bandera A, Colella E, Clerici M, Rizzardini G, Gori A. The contribution of immune activation and accelerated aging in multiple myeloma occurring in HIV-infected population. AIDS 2018;32:2841-6. Mameli G, Fozza C, Niegowska M, Corda G, Ruda MF, Barraqueddu F, et al. Epstein-Barr virus infection is associated to patients with multiple myeloma and monoclonal gammopathy of undetermined significance. Leuk Lymphoma 2017;58:466-9. Greipp PR, San Miguel J, Durie BG, Crowley JJ, Barlogie B, Bladé J, et al. International staging system for multiple myeloma. J Clin Oncol 2005;23:3412-20. Landgren O, Gridley G, Turesson I, Caporaso NE, Goldin LR, Baris D, et al. Risk of monoclonal gammopathy of undetermined significance (MGUS) and subsequent multiple myeloma among African American and white veterans in the United States. Blood 2006;107:904-6. Landgren O, Graubard BI, Katzmann JA, Kyle RA, Ahmadizadeh I, Clark R, et al. Racial disparities in the prevalence of monoclonal gammopathies: A population-based study of 12,482 persons from the National Health and Nutritional Examination Survey. Leukemia 2014;28:1537-42. Cornell CJ Jr., McIntyre OR, Kochwa S, Weksler BB, Pajak TF. Response to therapy in IgG myeloma patients excreting lambda or kappa light chains: CALGB experience. Blood 1979;54:23-9. Shustik C, Bergsagel DE, Pruzanski W. Kappa and lambda light chain disease: Survival rates and clinical manifestations. Blood 1976;48:41-51. Blimark CH, Turesson I, Genell A, Ahlberg L, Björkstrand B, Carlson K, et al. Outcome and survival of myeloma patients diagnosed 2008-2015. Real-world data on 4904 patients from the Swedish myeloma registry. Haematologica 2018;103:506-13. Gascón P, Arranz R, Bargay J, Ramos F. Fatigue- and health-related quality-of-life in anemic patients with lymphoma or multiple myeloma. Support Care Cancer 2018;26:1253-64. Cella D, Kallich J, McDermott A, Xu X. The longitudinal relationship of hemoglobin, fatigue and quality of life in anemic cancer patients: Results from five randomized clinical trials. Ann Oncol 2004;15:979-86.
van Zeben D, Bieger R, van Wermeskerken RK, Castel A, Hermans J. Evaluation of microcytosis using serum ferritin and red blood cell distribution width. Eur J Haematol 1990;44:106-9. Oh HJ, Park JT, Kim JK, Yoo DE, Kim SJ, Han SH, et al. Red blood cell distribution width is an independent predictor of mortality in acute kidney injury patients treated with continuous renal replacement therapy. Nephrol Dial Transplant 2012;27:589-94. Koma Y, Onishi A, Matsuoka H, Oda N, Yokota N, Matsumoto Y, et al. Increased red blood cell distribution width associates with cancer stage and prognosis in patients with lung cancer. PLoS One 2013;8:e80240. Wang F, Pan W, Pan S, Ge J, Wang S, Chen M, et al. Red cell distribution width as a novel predictor of mortality in ICU patients. Ann Med 2011;43:40-6. Mantovani A, Garlanda C. Inflammation and multiple myeloma: The toll connection. Leukemia 2006;20:937-8. Lee H, Kong SY, Sohn JY, Shim H, Youn HS, Lee S, et al. Elevated red blood cell distribution width as a simple prognostic factor in patients with symptomatic multiple myeloma. Biomed Res Int 2014;2014:145619. Hu L, Li M, Ding Y, Pu L, Liu J, Xie J, et al. Prognostic value of RDW in cancers: A systematic review and meta-analysis. Oncotarget 2017;8:16027-35. Lee HW, Choi HJ, Ha SJ, Lee KT, Kwon YG. Recruitment of monocytes/macrophages in different tumor microenvironments. Biochim Biophys Acta 2013;1835:170-9. Sponaas AM, Moen SH, Liabakk NB, Feyzi E, Holien T, Kvam S, et al. The proportion of CD16(+)CD14(dim) monocytes increases with tumor cell load in bone marrow of patients with multiple myeloma. Immun Inflamm Dis 2015;3:94-102. Petitprez V, Royer B, Desoutter J, Guiheneuf E, Rigolle A, Marolleau JP, et al. CD14+ CD16+ monocytes rather than CD14+ CD51/61+ monocytes are a potential cytological marker of circulating osteoclast precursors in multiple myeloma. A preliminary study. Int J Lab Hematol 2015;37:29-35. Bolzoni M, Ronchetti D, Storti P, Donofrio G, Marchica V, Costa F, et al. IL21R expressing CD14+ CD16+ monocytes expand in multiple myeloma patients leading to increased osteoclasts. Haematologica 2017;102:773-84. Shi L, Qin X, Wang H, Xia Y, Li Y, Chen X, et al. Elevated neutrophil-to-lymphocyte ratio and monocyte-to-lymphocyte ratio and decreased platelet-to-lymphocyte ratio are associated with poor prognosis in multiple myeloma. Oncotarget 2017;8:18792-801. Richardson LC, Pollack LA. Therapy insight: Influence of type 2 diabetes on the development, treatment and outcomes of cancer. Nat Clin Pract Oncol 2005;2:48-53. Khan AE, Gallo V, Linseisen J, Kaaks R, Rohrmann S, Raaschou-Nielsen O, et al. Diabetes and the risk of non-Hodgkin's lymphoma and multiple myeloma in the European Prospective Investigation into Cancer and Nutrition. Haematologica 2008;93:842-50. Richardson PG, Briemberg H, Jagannath S, Wen PY, Barlogie B, Berenson J, et al. Frequency, characteristics, and reversibility of peripheral neuropathy during treatment of advanced multiple myeloma with bortezomib. J Clin Oncol 2006;24:3113-20. Wu W, Merriman K, Nabaah A, Seval N, Seval D, Lin H, et al. The association of diabetes and anti-diabetic medications with clinical outcomes in multiple myeloma. Br J Cancer 2014;111:628-36. Xu CX, Zhu HH, Zhu YM. Diabetes and cancer: Associations, mechanisms, and implications for medical practice. World J Diabetes 2014;5:372-80.